Burnley boss Sean Dyche wouldn't be drawn on the prospect of more new faces ahead of today's transfer deadline. Speaking at last night's press conference ahead of the Europa League tie at Istanbul Besaksehir, Dyche was asked about the likelihood of adding to the arrivals of Ben Gibson, Joe Hart and Matej Vydra. And Dyche smiled: "This (the game) compromises it slightly. It’s an interesting day to have a game!" 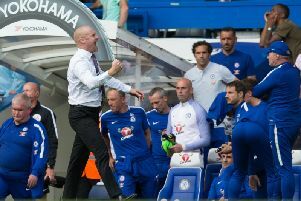 But he didn't rule out any more business - and, on top of Ben Mee signing a new contract on Tuesday night, what now would turn what has become a very good transfer window, into an outstanding one? Burnley have been keen to add a wide player all summer, to compete with Johann Berg Gudmundsson, Aaron Lennon and the returning Robbie Brady. And they have an interest in Everton's former Crystal Palace man Yannick Bolasie, though they have yet to make an offer for the player. Palace and Championship side Middlesbrough - on the back of selling Adama Traore to free-spending Wolves - are also keen on the 29-year-old. However, an asking price thought to be between £15-20m, and prohibitive wages, are a stumbling block, especially for a player who feared for his career after a serious injury. The longest-running saga of the summer has been Burnley's pursuit of former Clarets forward Jay Rodriguez. The club were still in negotiations with West Brom before leaving for Istanbul, but as of last night, no breakthrough was in sight. Burnley offered £25m as a joint-bid for Rodriguez and Baggies teammate Craig Dawson, which was rejected, while a £16m offer for Rodriguez alone was also knocked back. It is thought an £18m bid will be enough to tip the scales, although Sam Vokes has been linked as a possible makeweight in the deal. However, Burnley only have Vokes, Ashley Barnes and Jon Walters as available forwards for tonight's game in Istanbul, with Chris Wood picking up an infection after a bite, while new signing Vydra is neither registered nor fit enough to feature, and Nahki Wells could well make a loan switch to Derby County, though that could be completed after today's deadline.